FIXYOURTHINKING.COM / Need a brain? Borrow mine! : Same Deja Vu Again: Postal Service Fans Just Thugs too! Same Deja Vu Again: Postal Service Fans Just Thugs too! 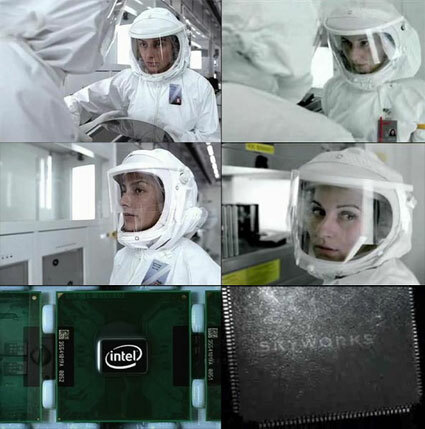 I wanted to wait a while to post information about the the new Intel advertisement controversy. In case you don't know what I'm talking about ... I'll give you the condensed version. At MacWorld Expo '06 Apple debuted a new commercial for the new Core Duo iMac & Core Duo Macbook (I still hate the name Macbook). The Intel processor ... for years it's been trapped inside PCs, inside dull little boxes, performing dull little tasks ... (blah blah shortened) ... starting today, the Intel chip will be set free ... to live life inside a Mac"
Some websites even featured interviews with Intel reps ... saying they had no knowledge of the ads. Of course, that's not exactly the way Intel would put it. "Never would we characterize our customers that way," Intel Vice President Deborah Conrad said in an interview. Conrad said that Intel cooperated with Apple for some particulars of the TV spot, but added, "We didn't know what the end result was going to be." "It's probably a good thing that we didn't see them earlier," Conrad said. Turns out, the Intel reps (a vice president of marketing = read as a nobody who could be fired at any moment) who did these interviews had no knowledge that Intel executive management DID KNOW about the ads. Executive management at Intel just didn't trust the loudmouths in the marketing department ... obviously for good reasons. Then, last week a controversy erupted over the ad being an exact copy of a music video done by a relatively unknown band called The Postal Service. The intent of this message was to get The Postal Service fans (however few there are) in an uproar and the Apple web, where dramatic news travels fast in a discussion about it ... turning it into a controversy. And whatta you know, it happened. My guess is ... the whole move by The Postal Service wasn't to actually bring any action against Apple, but exploit the Apple web for some free publicity. Frankly, the music of The Postal Service stinks ... I listened to all of the clips I could hear at the iTunes Music Store and they sound like a mix between an old Nintendo videogame and Moby's worst remix. And finally ... I have to hand it to watchmactv.com for their excellent side by side comparison of the Apple commercial and the music video ... well worth watching. Conspiracy theorists have started to draw parallels between this and the recent Apple vs Lugz shoes commercial controversy. I actually saw a lot of merit in Lugz claims. 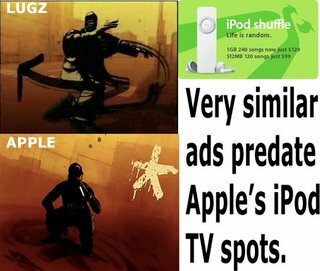 4) Unlike the Lugz ad ... the same director directed BOTH the music video and the Apple ad ... therefore HE is the one who should be in hot water ... if anyone should be scalded ... I mean scolded. And here's a note to The Postal Service ... in case you didn't know ... you are copying the US Postal Service by using their name. Good points. The Postal Service's comments imply that their approval was necessary, but clearly, the creative content was the director's artistic vision. So, unless they have some agreement with the director to not re-use the concept, they can just go to hell. Their outrage is falling on deaf ears. I really like the Postal Service's music, but what I'm writing about is to say that the person that Ben (also the singer for Death Cab For Cutie) should be mad at is the director of the Postal Service video. As I understand it, the same guy did both videos. Also probably mad at the person at Apple who hired him to direct the commercial, because they were undoubtedly familiar with the Postal Service video. You can get simliar in tone and feel without getting so close in content.